Durable black laminate finish with Oak laminate door and drawer fronts. 32" x 32" base plate with bumper T" molding. 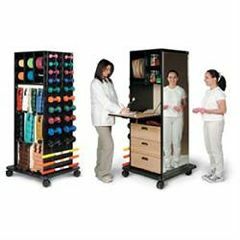 Built-in dispensers for up to (6) exercise band rolls. Almond coated pegboard for (16) optional cuff weights with (11) Pegboard safety hooks. (3) Sets of hooks for optional THERA-P Bars. (20) Sets of dumbbell hooks. Full view distortion-free glass mirror with ANSI shatter stop" safety backing. Built-in dispenser for hook-and-loop fastener(s) rolls (hook-and-loop fastener(s) not included). Convenient drop lid work counter with lock. (3) 8" high laminate drawers on nylon roller slides. 4" diameter swiveling locking casters. Dimensions: 32"W x 32"L x 72"H.